Nurse with face mask and syringe. 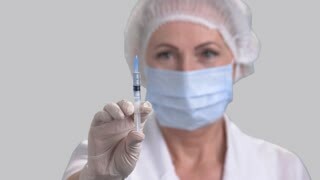 Young nurse holding syringe with injection while wearing surgical mask, blurred background. Old doctor in medical mask ready to make injection. Syringe with a dripping needle hand. Bright windows blurred background. Medical syringe in female doctor hand. Medical doctor in hat and mask holding plastic equipment for injection on green screen close up, focus on syringe. Female doctor pouring out liquid from syringe. 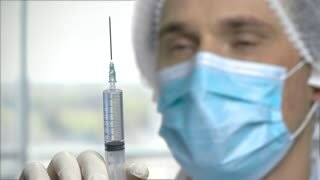 Medical worker in face mask preparing syringe for injection on gray background. Medicine and healthcare concept. Nurse or doctor holding medical syringe. Portrait of female doctor wearing surgical cap and face mask standing with injection on blurred background. Doctor with syringe. Close up, doctor in medical mask ready to make injection. Green screen hromakey background for keying. Close up man doctor holding syringe. Doctor in surgical mask and gloves preparing syringe for injection, focus on syringe. Child boy preparing syringe for injection. Caucasian kid in surgical mask and gloves holding injection syringe. Dream to be a doctor in future.